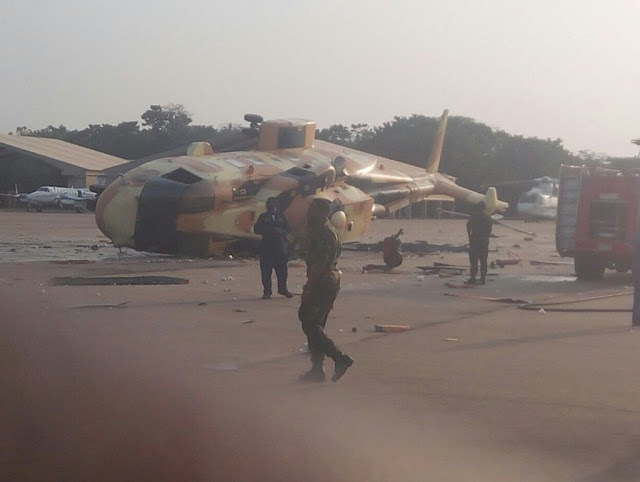 One of the Presidential AW101 helicopter, which was recently handed over to the Nigerian Air Force, has crashed at the Nigerian Air Force Base, in Makurdi. The crash is coming two months after President Muhammadu Buhari handed over the two ballistics defence capable aircraft from the Presidential fleet to the Nigerian Air Force. According to a report by TheNewGuru.com the jet crashed due to poor training of crew members. After the handover, the aircraft was repainted from the initial white and green to camouflage. A source told that damages to the jet were significant but no life was lost to the crash. According to a Leonardo release the AW101 combines the most advanced technologies, mission equipment, security features, outstanding comfort and manufacturing expertise to deliver a superior helicopter system. With its latest-generation integrated avionics, navigation, communications, safety and security systems, the AW101 offers a unique solution to the most extreme operational requirements of the 21st Century.